A brief synopsis – Michael is appalled at the corner the branch is painted into for the local ad spot for the branch. As a result, he challenges David Wallace (over Ryan’s objections) to give him one day to come up with a spot by the next morning. 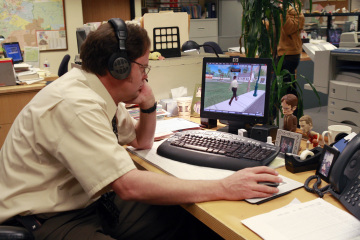 Andy moves towards first base with Angela, Dwight falls into the online game Second Life for relief. The rest of the staff is thrown into a wonderful creative effort that brings them together like never before. The best line – Michael: Dunder Mifflin. Limitless paper for a paperless world. The best moment – The commercial was pretty good, and looked sufficiently homemade. The best storyline – Everyone coming together for the ad. Would Michael have been reprimanded? – Not a chance here. Should have been commended. Solid half-hour show in a season of hour-longs. The only thing that went a little long was Andy’s “Kit Kat” routine. The rest was real solid. Great movement on both Andy’s relationship and Dwight’s reaction to his new-found role as “advisor” to Andy. Second Life Jim and Second Second Life Dwight are great, too.